... but sell more of their used vehicles at auctions. 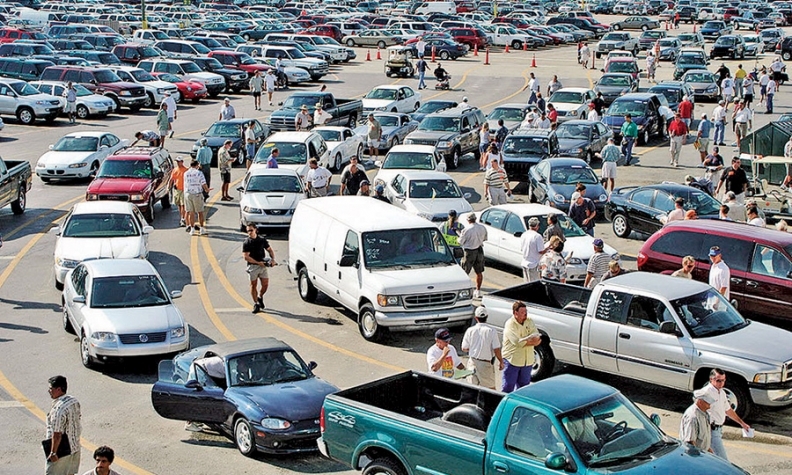 Franchised dealers relied less on auctions for used vehicles in 2012 than they had in more than a dozen years, data from the National Automobile Dealers Association show. On the other hand, those same dealers last year sold at auctions the biggest share of their used vehicles in more than a decade. The shifts in auction use came as wholesale and retail used-vehicle prices hovered slightly below the peaks reached in spring 2011. The average franchised dealership bought just 24 percent of its used inventory at an auto auction in 2012, down from 28 percent in 2011 and the lowest level since 22 percent in 1998, according to the annual NADA Data report released this month. Conversely, trade-ins -- on new- and used-vehicle purchases combined -- provided 61 percent of dealers' used-vehicle inventory in 2012, up from 57 percent in 2011 and the highest level since 62 percent in 1999. "Essentially, dealers are taking in more vehicles through trade that they never would have tried to retail before," says Jonathan Banks, an analyst at NADA Used Car Guide. "You see it all the way from the big public groups to the little dealers in rural areas. Trade-ins are in super-high demand." Tim Walters, owner of Walters Elkland Chevrolet, a small dealership in rural Elkland, Pa., says he is keeping a lot more high-mileage trade-ins for retail sale than he used to because the off-lease vehicles he prefers to buy cost more than he wants to pay. "Before, if a car had over 50,000 miles, I wasn't super interested in keeping it on the lot," Walters says. "Now, that's moved up to 80,000 or 90,000 miles." Demand for trade-ins also contributed to, and was reflected in, strong used-vehicle prices last year when the average retail price rose 2 percent to a record $17,547, NADA Data said. Net profit per used vehicle retailed in 2012 fell to an average of $194, from $269 in 2011. But it was still much higher than the net profit per new vehicle retailed of $111. Banks says 2013 data from NADA 20 Groups, a sampling of dealership data representing all manufacturers, show that gross margins on used vehicles this year through June averaged about 13 percent, up from about 12 percent in the year-earlier period, vs. about 4 percent for new vehicles. "The used market remains incredibly attractive" to dealers, he says. "They are continuing to do what they did during the recession, when they relied on used to keep their stores open. They realized the profitability of having a real strong used-car department." Even so, dealers last year wholesaled a bigger share of used vehicles than in 2011. Last year, the percentage of dealers' used vehicles sold at retail fell to 55 percent, while the share they wholesaled rose to 45 percent. In 2003-06, they retailed 60 percent and wholesaled 40 percent. The retail portion hit a recent peak of 63 percent in 2008. Ricky Beggs, managing editor of Black Book, says dealers kept a lot of older used trade-ins during the worst of the recession, but he believes that is changing as new-vehicle sales pick up. He recalls a recent conversation with a franchised dealer who had sent about 36 used vehicles to auction over a two-week period. Of those, 30 were 9 years old or more. "A couple of years ago, he was keeping those type vehicles," Beggs says. Paul Walser, CEO of Walser Automotive Group of Bloomington, Minn., says the quality of many of the vehicles he takes as trade-ins is poor because many of his customers kept their vehicles much longer than usual during the recession. That's why the number of vehicles he wholesaled rose 6 percent to 8,355 in 2012 from 2011, but the revenue they generated dropped 51 percent to $43 million, he says. "We're auctioning a much higher percentage of our trades than we ever have. It's a lot of junk," Walser says. "It used to be that we could retail 75 to 80 percent of our trade-ins. I'd be surprised if we can retail 30 percent of them now."